In our age of enhanced, ever-shifting technology and space-saving advancements across every aspect of our lives, there are some things that remain a trick to look after, especially when it comes to our all-important home appliances. While it’s true that many of our most common appliances and whitegoods have undergone technological revamp in recent decades – transforming from cumbersome, bulky units into streamlined, relatively effortless-to-use items – with some, there’s only so much that can be done where the saving of space is concerned. Of all our home appliances, it’s perhaps the common washing machine that still causes the most of our logistical headaches. Of course, it should be noted that washing machines aren’t the bulbous, clunky things they used to be; these days, they’re slick and space-age—yet the need for space remains: even for a humble household of one or two (to say nothing of a large family household) the washing machine demands a decent amount of size and space to move. No matter the constraints of our modest apartments and lofts, we need to account for our machines and accommodate them accordingly. Are your wrestling with the washing machine in your life? 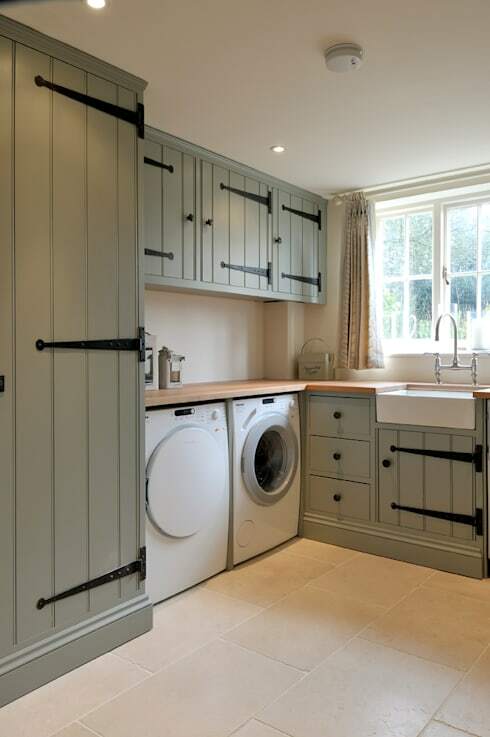 Today on homify, we’re taking a look at this traditionally (and still rather) cumbersome whitegood utility with a few unique and interesting, and indeed perhaps even ingenious, ideas for how to store your washing machine at home. Keeping this sort of thing discreet can be a mighty challenge for the more miniscule abode; today, we’re here to help! Read, and turn the dial of those washing machine blues from ‘woe’, to go! Indeed, the washing machine is a much different beast in this day and age, and yet, aesthetically, it remains much the same as it always has. Depending on your sense of style and taste, the common washing machine is not the most visually pleasing item to have lurking around your home (which is probably why discreet laundry rooms were invented in the first place!). If you’re struggling to work out where to place the machine without compromising the aesthetics of your home (especially if you don’t have the luxury of a dedicated laundry room, given tight floor plan constraints), consider a little crafty cabinetry to keep that machine closed off and tucked away. Here, we see a neat, clever take on what’s possible: a finely crafted cabinet, and a perfect fit, whether included as part of a kitchen, bathroom, or adjacent multi-purpose utility room. Considering a little cabinetry but don’t know where to start? Looking for some other options to save space, while keeping the washing machine inside? Why not chat to a professional to get a few pointers and some wise advice on how to make the most of your space, and keep your machine discreet? 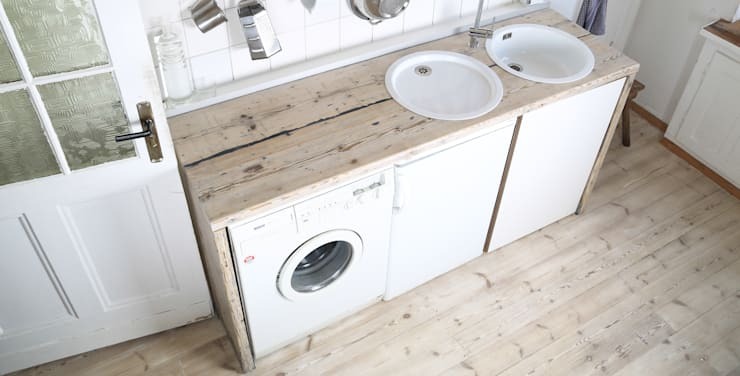 Of course, we can’t be too harsh on the aesthetic drawbacks of the washing machine: in fact, they can look rather great when embedded as part of a set of whitegoods, or in the midst of a neat interior shelving unit or open cabinet setup. Take this fabulous example here as your cue: a delightfully designed open timber kitchen cabinet, offering ample room not only for the fridge and freezer, but the washing machine too – embedded thoughtfully, yet just as discreetly, as part of the kitchen décor. 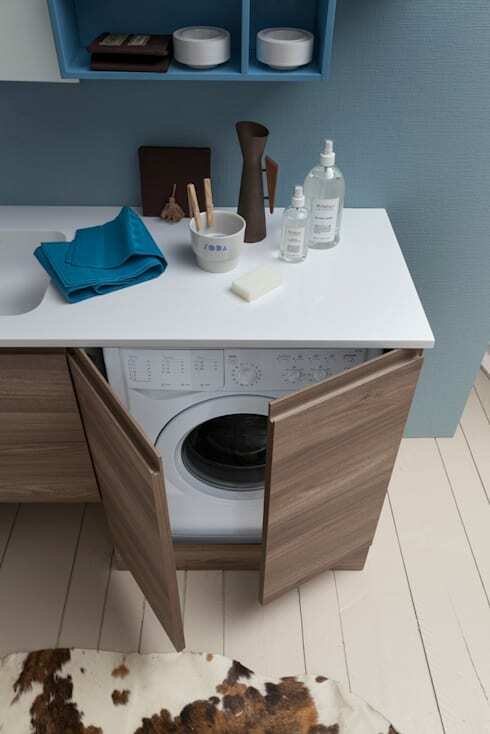 When blended with light, natural polished timber flooring and worktops, and coupled with brilliant white wall tiling and sinks, the washing machine can really look at home. If you’re not terribly fussed about how discreet or indiscreet your washing machine happens to be, then it’s a great idea to implement it as part of the mix, whether it happens to in your kitchen, bathroom, or, if you happen to have one, laundry room. If possible choose a plain white washing machine with little fanfare or additions, and the unit will be able to blend in well with the rest of the room’s décor – take this example as a sneak peak of what’s possible: a cosy, quaint bathroom-utility area, blended together with relative effortlessness, for ease of use. While we mentioned that washing machines haven’t change a whole lot visually since the early advent of the invention back in the ‘50s and ‘60s, their size certainly has shifted, as well as the variety and range of sizes available to the consumer. If you’re dealing with a space-limited abode, consider first and foremost selecting the smallest possible washing machine you can, but one that also covers your household needs. 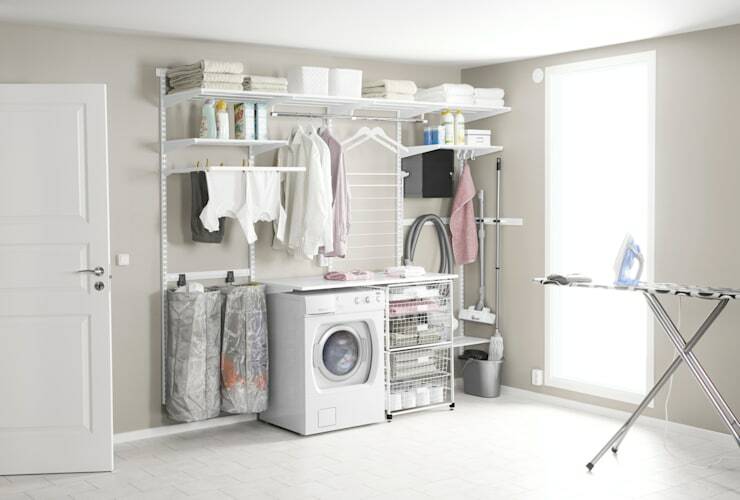 Here, we see just how little space a smaller unit requires in a laundry room or bathroom. Even when coupled with a spin dryer unit, the washing machine can actually look quite neat when left exposed, especially when surrounded by such well-appointed and neatly designed cabinetry. 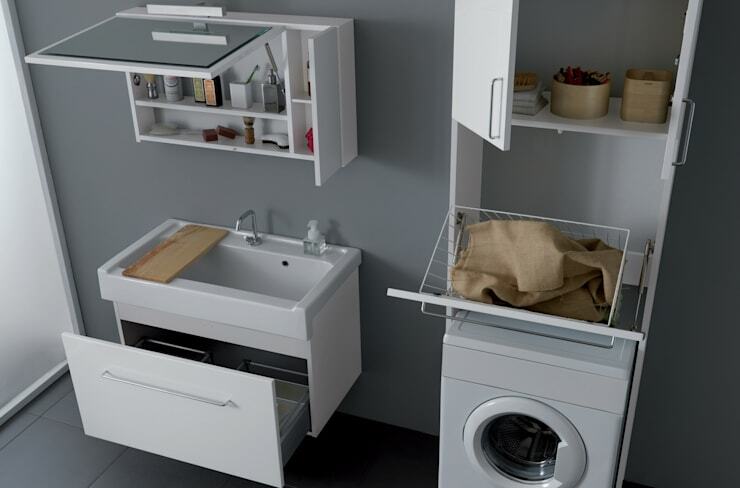 You may also be of the opinion that items like the washing machine are in fact made to be on show, that they give a certain utilitarian spark to a home's given washroom or multi-purpose spaces. If that’s the case, then look no further than this neat setup: a bright, open and airy laundry room where the washing machine is allowed to take center stage. No, it’s not what you’d call discreet, but it holds its own in this context in the middle of things. As part of a range of tools, devices and storage units, the washing machine need not be hidden away at all – blending in as part of a team, this space would be much worse off aesthetically (and functionally) without it. In a perfect domestic world, we’d all have a range of rooms dedicated to all the needs and specific purposes of our day to day lives: a study, a library, an attic, games room and bowling alley, and a fully appointed, luxury laundry room where everything can be found in its rightful place. Well, perhaps the dream will one day come to fruition, but in the meantime, we have to work with what we’ve got, and what we’ve got, especially when it comes to modern apartment living, is often less space and room than we’d prefer. In this regard, we need to condense our spaces, and if not the kitchen, then our laundry items and utilities generally need to find their home in the bathroom. 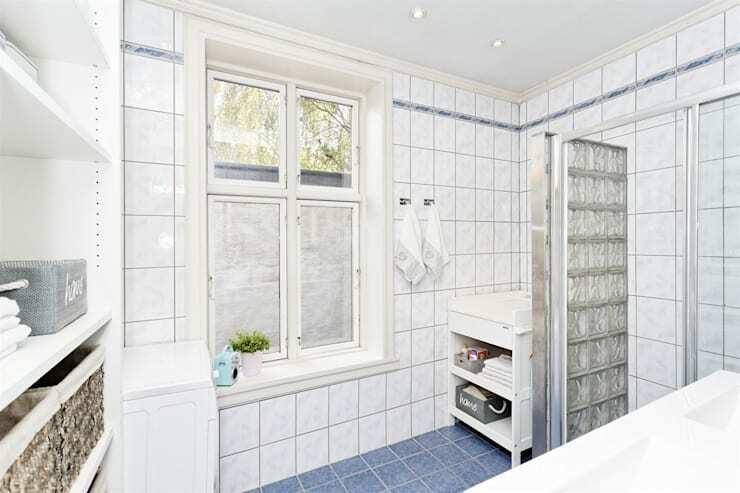 As we’re reminded here, however, that’s not necessarily such a bad thing: this delightful, quaint bathroom loses nothing of its charm with the stealthy inclusion of this corner washing machine: out of the way, out of mind, yet no less accessible. Did you enjoy that Ideabook? Why not keep the fresh, compact ideas flowing with a look at The Hidden Beauty House? Do you have any other washing machine storage tips for our readers? We’d love to hear from you in the comments section below!